Listen to alphabet songs, and maybe join in? This is a good Russian alphabet app, available free on Android and Apple. Let us know if you find any other good apps. ​The first letter (А) is a capital or "uppercase" letter, used for the beginning of sentences and the names of people and places. The second letter (a) is a small "lowercase" letter. Some letters (ы, ь, ъ) are only used in lowercase because they don't appear at the beginning of words. These are the printed versions of all the letters - used in books, and when you type on a computer. You can find handwriting letters here. 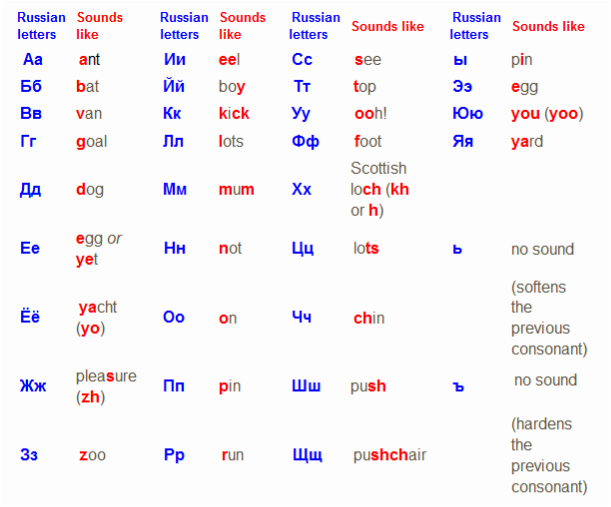 ​Some Russian words are a bit like English. If you use the alphabet decoder you will be able to read the words below and guess what they mean. Which is the odd one out in each line? Download and print a larger version so that you can write on it. When you have finished you could look up some of the people and find out more about them (using the SEARCH bar at the top of this page or looking at other sources) and add that to the names here: Word / PDF. You might find their pictures too? Do you know any other famous Russians? Let us know. We’ve hidden the first names of all the people on the list of Famous Russians in this wordsearch. Some are horizontal (left to right), some are vertical (top to bottom), and some are diagonal (top left to bottom right). Can you find all 10 of them? We’ve also hidden just ONE second name. Can you find it? Now try to write Russian! If you'd like to try handwriting you can see how the letters are written here. Then try them out with this excellent downloadable practice sheet (from Philip Seifi at Lingualift). Or use this IPad app. Or you can use your computer to type in Russian. You could use this keyboard to start with - but it would be better to find out how to install a Russian keyboard on your computer or tablet. It's usually very simple. When you have done that you can copy some of the Russian words on this page. This is a 96 page pocket-sized booklet in full colour to help travellers and learners of Russian learn the Russian alphabet and at the same time meet a range of cultural, historical and practical references as a general introduction to the Russian language and to Russia and Ukraine.